More than 30 applications was submitted to SIP STRIM and EIT RawMaterials yearly innovation idea competition. The jury picked out the twelve most innovative ideas to be pitched at the pitch event at Luleå Science Park on February 13th. The jury has deliberated and the winners are Atium AB and ReVibe Energy, which receive SEK 600,000 each to realize their idea. 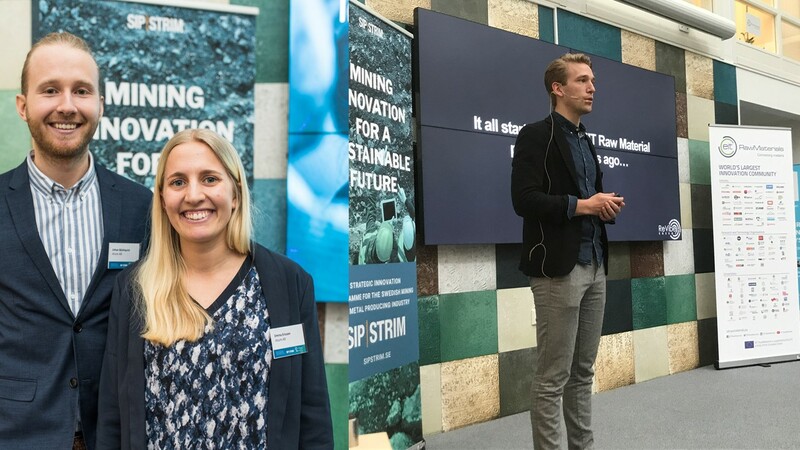 Atium AB won the award from SIP STRIM for its solution for a more efficient and sustainable purification of water from mercury. Emma Ericson and Johan Björkquist who have run Atium together for the past one and a half year stands behind the idea together with the researcher Björn Wickman. – It feels absolutely incredible, we are so happy and grateful, says Emma Ericson. The profit makes it possible for us to develop a small-scale prototype that we can test with potential customers. Validating the technology on a small scale is extremely important in order to attract both customers and investors in the future, in order to later be able to scale up the technology. The other prize was awarded by EIT RawMaterials and went to ReVibe Energy for their innovative solution with wireless recording and analysis of vibrations and shocks for monitoring equipment in mining and industrial environments. – We are incredibly happy and enthusiastic about the fact that EIT RawMaterials, just like ourselves, sees the potential that exists in the mining sector with our new product ReLog, says Viktor Börjesson at ReVibe Energy. Through more precise vibration measurements, it becomes easier for our customers to understand and manage their machines and assets, one step closer to a well-implemented digitization of the mining sector. Jury’s motivation: Mercury is one of the ten most dangerous substances for human health, according to WHO. At the same time, it is an extensive global problem. Many industries, including the mining industry, handle mercury in process and waste water. Atium AB develops a more efficient and sustainable technology to selectively clean water from mercury with a reusable filter. The method can clean low concentrations in an energy-efficient manner. The idea has a great development potential because purification of mercury is a global need, and there are also opportunities to develop the method for purifying water from other heavy metals. Jury’s motivation: An innovation that will enable new capabilities for EIT RM value chain in improving maintenance and efficiency by detecting and collecting data with higher accuracy and capacity in a mobile and battery driven environment.